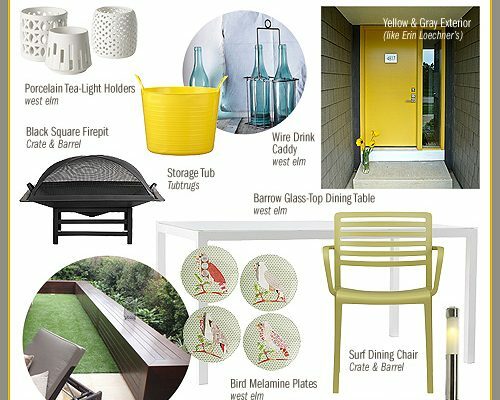 Last year, I worked on our front porch for a Better Homes & Gardens 48-Hour Challenge. It was a lot of fun and we even won, which was awesome (and all thanks to you). I spend a lot of time out front sitting with Eleanor because she loves to watch people walking by, especially if they’re walking by with a dog, and we’ve really had a good time enjoying the front porch as a family. This year though, I decided to give the furniture from our porch to my mom. My mom has two small children of her own, and they’re living on just her husband’s salary while she stays home with the kids (my very young brother and sister) and goes back to school to switch careers (she has always wanted to be a teacher). My mom and I both fell for gardening in the last couple of years, and she has turned her backyard from barren and weedy to something lush and beautiful. The only problem is that she doesn’t have a lot of extra money right now, and she only had two little chairs for her entire yard. 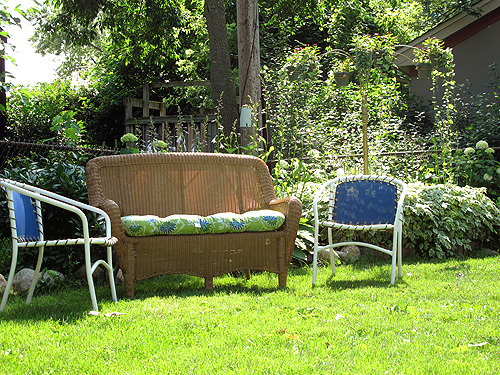 I thought that the table and chairs and bench from our porch would look really cute in her yard, and in that way I’m able to share with her some of the opportunities that I’ve had through the blog. I don’t know if my mom is going to paint the pink set (I told her to go ahead — my feelings will not be hurt), but doesn’t it look great in her yard? And I love that she added a cushion to the bench to tie it in with the chairs that she already had. Nicole, this post brought tears to my eyes! Your mother is lucky to have a daughter like you! 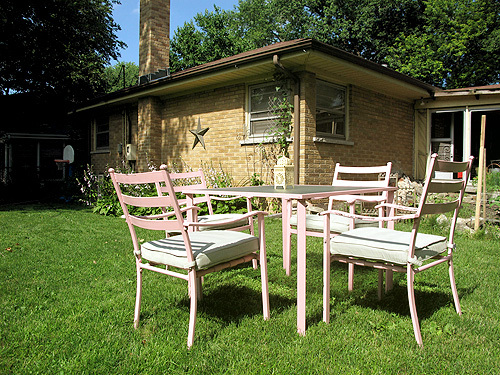 The pink chairs & table are so pretty! You are the best daughter ever! What a wonderful gift to give her. You’re aces!!! It DOES look great there! Gives me a great idea for my mum’s 50th birthday this summer. What a very sweet daughter you are! And it is always a treat when someone gives you a gift to go with a project you have been working very hard on! Let her know her hard work paid off! How sweet of you! Your mom is a lucky woman and the furniture looks great! Isn’t it nice to have an opportunity to give back to our parents? My parents have done so much for me so anything I do for them is a drop in the bucket comparatively. Sometimes, though, there are things I can do that really make a difference and it really feels good. You are a super sweet daughter! The pink set looks amazing in her garden, very Cath Kidston-esque I think! The furniture looks great in her yard! What a sweet post. The set looks great in your mom’s garden. And how lucky is Eleanor to have an aunt and uncle so close to her in age! How great that your Mum is studying again and chasing her ambition. I love that you are supporting her and able to help out in this way. I like I like I like! And i think the pink is perfect for the whole setting….I also checked your link for your mom’s yard..amazing! Aww, I loved this post. Looks great in her yard! I didn’t know you had younger siblings. When do we get to meet them? Bravo to your mom for working to become a teacher. It’s never too late to change the world, and teachers do that by giving the next generation the skills to do great things. Hats of to you for your amazing generosity! And good luck to your mother in her future career! My cousin is starting her teaching internship this year and she is absolutely thrilled. It’s great to have the ability to make a difference. where did you get the table and chair set. i am looking for a small square table for my porch and i have not found anything i like plus most are round. i love round but i need square for the space. Nice that Eleanor has relatives so close to her in age. I feel a little bad that my daughter will be an only child with cousins who are 10-15 years older, but hey, you can only control so much! 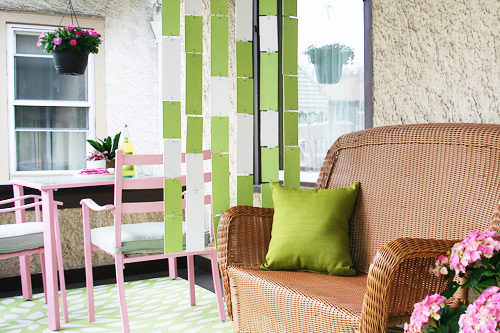 I actually think they should start making and selling pink patio furniture – looks really awesome on green background.